Glacier ExperienceTrip difficulty: 2 out of 5 possible. Rated: Easy/Family tour. Tour Details:Duration: approximately 10 hours. Included: Pick-up from your hotel in Reykjavík, a guided visit to Seljalandsfoss, Skógafoss and Sólheimajökull in a bus, glacier walking with a certified glacier guide and a all necessary equipment for glacier hiking. Clothing: Warm outdoor clothing, waterproof jacket and pants, head wear and gloves. Good hiking shoes are recommended and can be rented if you do not have them. Travel through south Iceland's farming lands, thundering waterfalls, powerful volcanoes and majestic glaciers along the coast! Walk behind the magnificent wall of water from Seljalandsfoss waterfall. 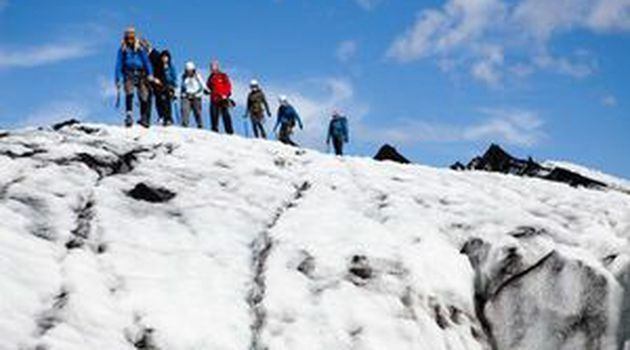 Take an easy hike on the ancient ice of Sólheimajökull glacier with a knowledgeable and certified glacier guide. We end this great tour with a stop at Skógafoss waterfall. There you can walk up to the 60 meter high thundering waterfall to take your most memorable photographs. 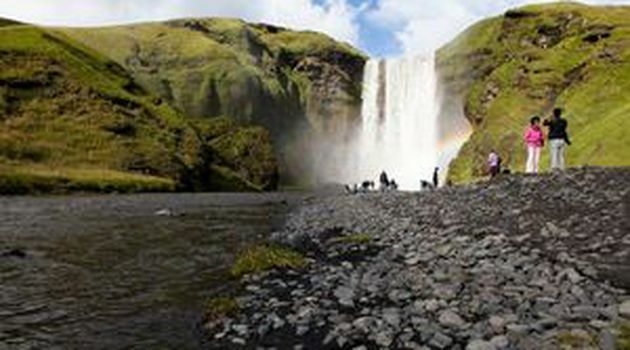 Tourists may even walk up the side to gain a bird's eye view of the cascading water and rainbows. Experience all of these incredible landscapes as we pass through the fertile farming lands and small villages of south Iceland, where the land is rich in Viking history and heritage and watched over by the infamous Eyjafjallajökull and Hekla volcanoes. On clear days you will have an excellent view of these famous volcanoes. When we drive under the foothills of Eyjafjallajökull you can glimpse the Westman Islands rising steeply from the ocean just a few kilometers off the coast. Book this great value and easy sightseeing tour with an adventurous twist. The sights are breathtaking, the grandeur unforgettable. 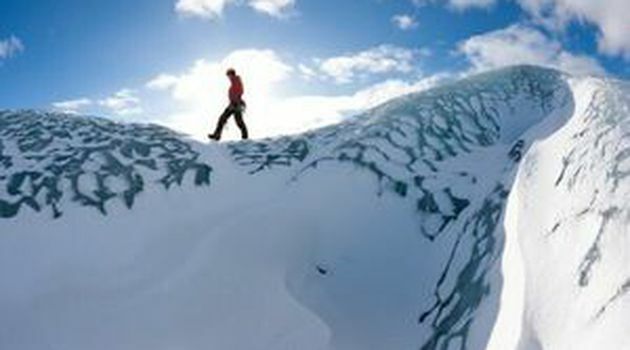 Where else in the world can you stand on 700 years old glacier ice and walk behind a 65 meters high waterfall in one day? 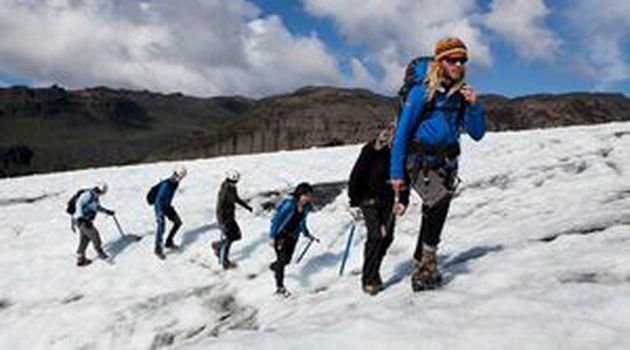 * Views of Eyjafjallajökull glacier and Hekla Volcano are subject to weather conditions. Please note: Arctic Adventures reserves the right to alter the itinerary if weather conditions change and the glacier walk is cancelled. 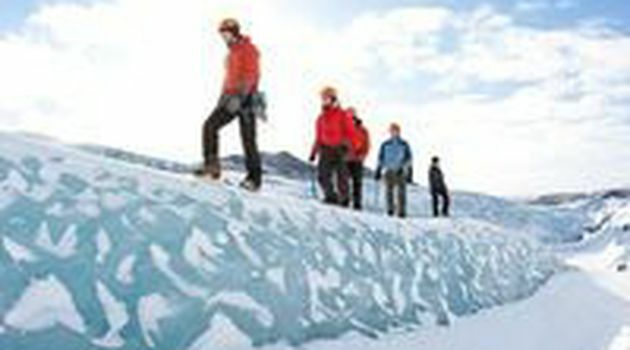 Disclaimer: All glacier and sightseeing trips are undertaken on the responsibility of its participants. Arctic Adventures does not assume any responsibility for accidents which are caused by its customers or can be traced to there own actions. Participants may have to sign a waiver before undertaking all trips stating that they realize that all outdoor activities carry an inherent risk. 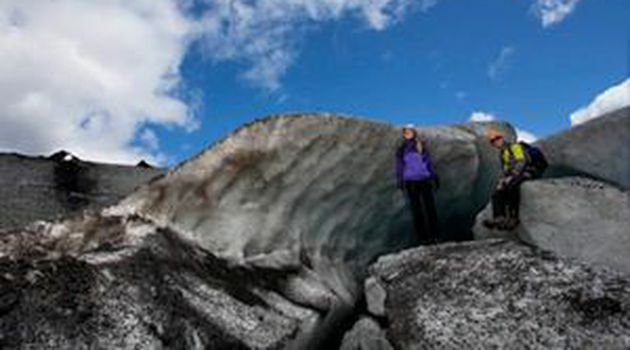 Pick-up from your hotel in Reykjavík, a guided visit to Seljalandsfoss, Skógafoss and Sólheimajökull in a bus, glacier walking with a certified glacier guide and a all necessary equipment for glacier hiking. Warm outdoor clothing, waterproof jacket and pants, some headwear and gloves. Good hiking shoes are recommended and can be rented if you do not have them. What is your pants size?